If you’re headed to Chile, you’ll likely end up flying into Santiago for some amount of time. One of the most unique things about Santiago is its proximity to both the coast and the mountains. After taking some time to explore the city, it’s worth taking one of the many Santiago day trips to explore the surrounding regions. It would be a shame to miss out on the incredible cultural and natural attractions in the areas surrounding Santiago! Whether you’re into Nobel prize-winning poets, lounging on the beach, or hiking through the mountains, there are plenty of unique Santiago day trips for any kind of traveler. Want to learn more about the best day trips from Santiago? Read on for our top picks. 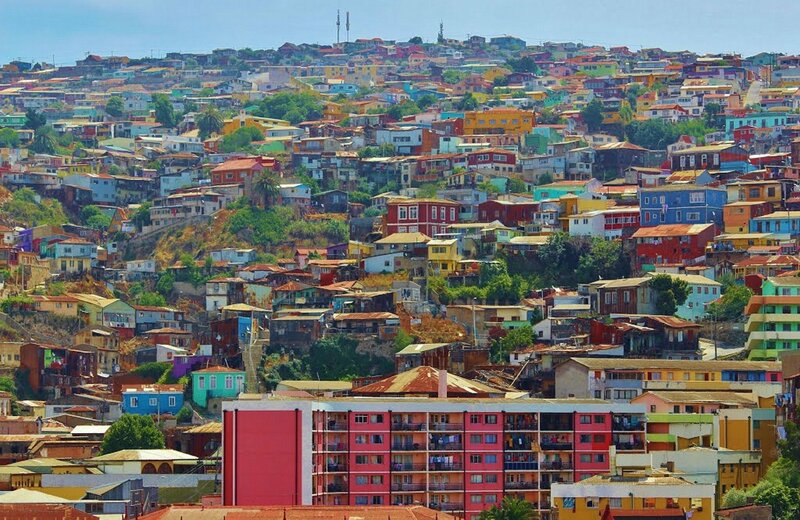 Valparaiso, Chile is quite possibly one of the most colorful cities in the world! How to get there: Pullman and Turbus buses leave frequently from Santiago to Valparaiso. It takes about 1.5 hours and costs ~6,000 CLP to arrive in Valparaíso from Santiago. You can also take a guided day tour from Santiago. A charming seaside town wedged between a shipyard and a hill, Valparaíso (or lovingly named ‘Valpo’ by the Chileans) is one of the most wonderful day trips from Santiago. Its significance as a port city and cultural hub in Chile earned it recognition as a UNESCO World Heritage Site. Valparaiso’s laid back streets boast beautiful boutiques and vibrant street art around every corner. If you’d rather skip the hassle of figuring out transportation and logistics, a day tour from Santiago with a local guide is also an easy and fun option. While in Valparaiso, visit the Nobel prize-winning poet Pablo Neruda’s quaint home, which overlooks the sea atop a hill. Or, you can take the funicular car up to the top and get lost wandering through the city’s winding alleyways and admiring colorful street art on the way down. You can also take a guided walking tour to learn more about the city of Valparaiso and its historic and cultural significance. While there, sample some fresh, delicious Chilean seafood at the Caleta Portales. Vina del Mar, Chile is full of blue water and seaside splendor. How to get there: By bus, it takes about 1.5-2 hours and costs ~6,300 CLP to arrive in Valparaíso from Santiago’s Pajaritos bus terminal. You can also take a guided day tour from Santiago, which includes Viña del Mar. As Valpo’s friendly neighbor, Viña del Mar is a classic beach town. With sparkling surf crashing alongside rocky cliffs, it’s the perfect place to catch some sun or simply enjoy the fresh sea air with a pisco sour in hand, while people-watching or tasting some fresh seafood dishes. Pair an afternoon in Viña del Mar with a morning in Valparaiso, or simply spend the day wandering this beach area. Within Viña del Mar, you can visit the Reloj de Flores, a giant clock made of flowers that’s one of Viña del Mar’s most popular (albeit cheesy) attractions. Alternatively, you can head to one of the local museums or visit a real life castle, the Castillo Wulff. If you want to get away from the crowded shores of Viña del Mar, head a bit farther down the coast in a local bus to the quieter towns of Reñaca and Concón. Here you can truly get a break from the energy of the city and enjoy the peace and tranquility of the Pacific Ocean. How to get there: There are Pullman buses from Santiago’s Pajaritos Bus Terminal that pass through Isla Negra en route to other destinations (be sure to ask the employee at the bus station for more detailed instructions). Alternatively, you can sign up for a guided group tour like this one to Isla Negra from Santiago, which includes a wine tasting (umm, count me in!). If you haven’t quite had enough of Pablo Neruda in Santiago and Valparaiso, you’re in luck! His third home, open to the public, is a quick hop from Santiago in a small town called Isla Negra. Many travelers claim that this is his most fascinating home, with very different decor and history than his other two homes. While you can catch a public bus to Isla Negra, it’s recommended to go on a guided tour with an expert who can provide context on the history of Neruda’s home. A guided day tour from Santiago, like this one, is an excellent alternative to doing it yourself. Outside of Neruda’s house, Isla Negra is also surrounded by a charming, seaside town with craggy rocks, offering a lovely place to spend a day and get some peace and quiet. Alternatively, you can pair this day trip with the next one, visiting both Isla Negra and Pomaire on the same day. How to get there: Buses from Santiago run frequently to nearby town Melipilla. From there, you can hop on a local bus onward to Pomaire. There are also a handful of direct buses to Pomaire – for these be sure to inquire at the bus station kiosk. 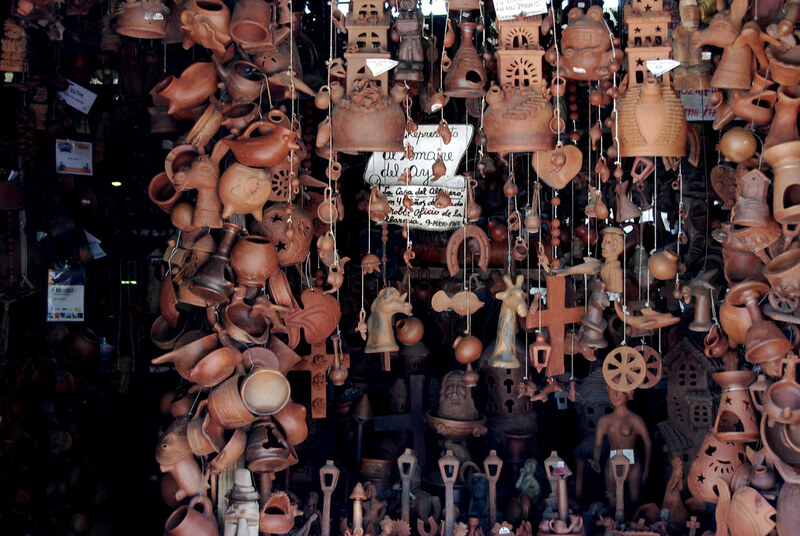 Are you a fan of artisan goods, handmade pottery, and charming pastoral living? If so, Pomaire is one of the best Santiago day trips. This town became an artisan hotspot because of natural clay deposits in the nearby land, causing the pottery industry to boom here. Pomaire’s iconic pottery symbol? A reddish clay pig often found in homes and restaurants. If you’re getting hungry during your trip, Pomaire is also home to some of the biggest empanadas in Chile, ranging from 1.5 kg to 10 kg! You can get them just about anywhere, but the ones at San Antonio Restaurant are excellent. Share one with a friend, or come hungry and devour one all by yourself. A day trip to Pomaire goes well with a morning in Isla Negra (above) or paired with exploring the nearby city of Melipilla. How to get there: The easiest way to get around Casablanca Valley is to rent a car and drive (responsibly). You can also book a guided wine tasting tour from Santiago to several of the wineries in the Casablanca region. There’s also an option to take a bus to Casablanca, then simply visit the wineries by private taxi from there. However, if you’re planning on drinking, we recommend booking a full day tour from Santiago (like this one or this one). On a tour, you can sample many wineries in the Casablanca region without worrying about transportation. If you want to take a couple of days to see the different wineries, we suggest getting a hotel. For a splurge option, the Hotel Boutique BC Wine Casablanca is a beautiful, locally-owned hotel that can help you book wine tours. For those on a budget, check out Umawtu Bed and Wine, another well-rated local B&B. The greenery of Maipo Valley borders Chile’s stunning mountains. How to get there: Again, the easiest way to get around Maipo Valley is to rent a car and drive (responsibly). You can also book a guided Maipo valley tour from Santiago to the most famous vineyards in the Maipo Valley region. On the opposite side of Santiago, right next to the Andes Mountains, is the Maipo Valley, home to even more vineyards of both the red and white variety. As one of the most popular Santiago day trips for wine lovers, you can sample the amazing variety and flavors of Maipo Valley wines. The famed Casillero del Diablo (of Concha y Toro Winery) is located here, as well as several other famous Chilean vineyards that specialize largely in Cabernet Sauvignon and other cold weather varieties. To hop around and do a few tastings, we recommend you book a wine tasting tour that provides transportation directly from Santiago. Maipo Valley is so close to Santiago that we’d recommend staying in Santiago and commuting each day. However, if you’d like to stay closer to the vineyards, you can book a room at La Calma de Rita, a centrally located lodge in Maipo Valley. How to get there: The simplest way to get to Valle Nevado from Santiago is to rent a car and drive in from Santiago. However, if you prefer to take shared transportation, there is a shuttle option called SkiTotal that costs 18,000 CLP each way. Whether you’re there to ski or simply to enjoy the scenery, a day trip to Valle Nevado (or “Snow Valley”) is definitely worth taking. During the winter, Valle Nevado is perfect for beginners to advanced skiers who want to get some slope time. For non-skiers (or during the off-season), the mountain views here are some of the best in the region, and people come from all over the world to ski these slopes. If you’re looking for a relaxing day in a stunning mountain lodge, Valle Nevado is one of the best day trips from Santiago no matter the season. Although pricey, there are several hotels connected to the Valle Nevado Ski Resort, like the Valle Nevado Hotel. If you’re on a budget, we’d recommend looking for an apartment or off-site hotel in the area instead. Beautiful Cajon del Maipo has tons of things to do for adventure travelers. How to get there: You can get to Cajón del Maipo on Santiago’s public transit. Take the metro to Bellavista de la Florida, Las Mercedes, or Plaza de Puente Alto, then hop on Bus 72 to Cajon del Maipo. You can also take a colectivo (shared taxi) from Metro Las Mercedes. If you’re reading through this list and wondering which day trips are good for nature lovers, you’ve finally arrived! Cajón del Maipo is a stunning mountainous gorge located just over an hour from Santiago. Hiking: The most popular hiking trails in Cajon del Maipo are El Morado Glacier and San Jose Volcano. All of these activities and more can be done as a day trip from Santiago, but if you’re interested in staying a few days in Cajon del Maipo, you can camp or book a local guesthouse nearby. How to get there: You cannot access Sewell Mining Town without being on an organized tour, since private vehicles cannot enter this protected area. However, you can book a guided tour to this ghost town online. High in the Andes lies Sewell Mining Town, which is now a historic ghost town and UNESCO World Heritage Site located just a few hours from Santiago high up in the Andes Mountains. It’s fairly far from Santiago’s city center, but is worth the trip, especially if you’re interested in historic landmarks. Founded in the early 1900s, a large Chilean company built Sewell Mining Town to extract copper from the surrounding areas. In the 1990s, the operations stalled and it was abandoned shortly after. Inside the town are colorful houses, a main square, and old shops and businesses that now lie completely deserted. You can’t go to Sewell Mining Town on your own, but you can book a guided tour to Sewell that will bring you from your Santiago hotel to the town along with a guide who can teach you about the fascinating history of this place. It’s a unique and worthwhile place to visit, and is one of the most fascinating of all of the day trips from Santiago. Have you been on any of these day trips from Santiago, Chile? Do you have another to share? Tell us about your experiences in the comments!